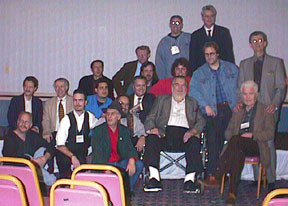 The 1997 A-1 Multimedia Convention at the Capital ended on 9 February. Here are some pictures from the convention. 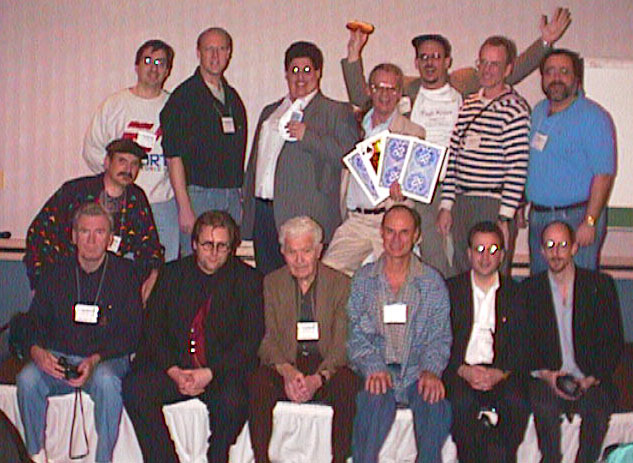 Quite a few members of SAM 94 (Palo Alto, California) attended the convention... so did many EGers. I'm trying to list everyone in these pictures, but I've either forgotten some names, can't figure out who's who, or couldn't take a guess at how to spell the names. Sorry for errors!! Please email me any missing or misspelled names and I'll correct these lists. Most of the performers and lecturers plus a few other people. Kneeling (l to r) are Paul Harris, Eric Mead, Juan Tamariz, and Jerry Camaro. 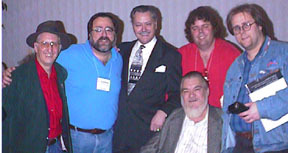 Behind them, sitting down, are Darwin Ortiz, Simon Aronson, xxxx, Martin Nash, Larry Jennings, and Jerry Andrus. Standing behind Jerry are R. Paul Wilson and Tom Mullica. Sitting on the stage are xxxx, Gordon Bean, xxxx, and Larry's friend. Standing in the Back are xxxx, and Rafael Benatar. There were quite a few EGers at the convention too. 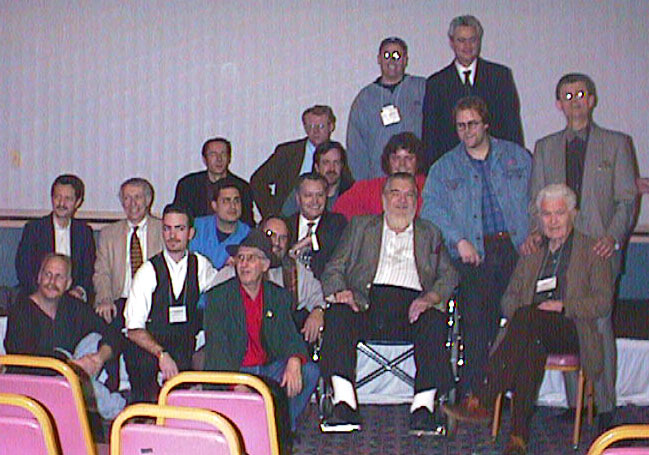 Front row (l to r): Bruce Sandercock, R. Paul Wilson, Jerry Andrus, Palmer Tilden, David Berkompas, xxxx. The second row, all by himself, is Barry Brilliant. 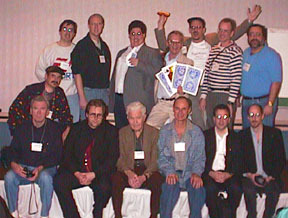 The back row is Jeff Haas, Eric Fronberg, David xxxx, Jim Fish, Mark Joerger, Pete McCabe, and Glenn Tenney. I couldn't resist, here's a picture with me and my "twin"... Michael Finney (well, our names end with "nney"...). I'm posting some of the MANY pictures I took. I've separated them into a few categories... since there are so many pictures and so little bandwidth on the slow-speed link this is running on. If there are captions missing or incorrect on any of the pictures, please let me know. This site Copyright © 1997 Fantasia Systems Inc.